Treat your guests to some delicious pirate party drinks. Serve your buccaneer beverages in large handled steins to give your party a true pirate feel. Railean has some great pirate drink recipes. To add even more fun, check out flea markets and second-hand shops for interestingly shaped liquor bottles or sauce bottles. Be sure to clean and sterilize them thoroughly. Fill the bottles with your beverages of choice and label them with these printable pirate party drink labels. 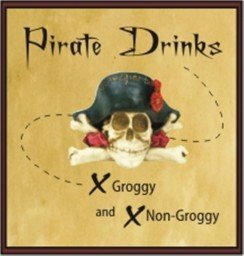 In pirate lingo... groggy = drink with alcohol and non-groggy = drink with no alcohol. If you're having a kid or teen party, fill the bottles you find with coke and/or gingerale and label them with non-groggy rum and ale labels respectively. Print the labels on regular paper and then, glue them to the bottles or print them on full sheet label paper and then, peel and stick them to the bottles. For extra protection for the labels, cover them with clear mactac before cutting them out. Mix together an odd variety of liquids that are safe to digest, but taste horrible (eg. 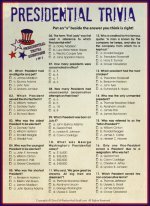 coke, vinegar, tabasco sauce, pickle juice, whatever you can think of) and attach a "Drink if You Dare" label to the bottle. At the last pirate party I hosted guests were betting each other as to how much and how fast they could drink these weird concoctions.